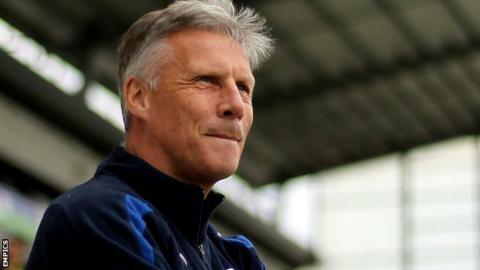 Bristol Rovers have sacked director of football John Ward following the club's relegation from the Football League. The 63-year-old returned to the Memorial Stadium in December 2012 for his second spell as manager. But with the team struggling at the bottom of League Two this season, Ward was moved to director of football in March, with his assistant Darrell Clarke taking over as boss. But Clarke was unable to stop Rovers dropping into non-league football. Their fate was confirmed last Saturday, on the final day of the season, following their 1-0 defeat by Mansfield. Chairman Nick Higgs told BBC Radio Bristol: "After what happened on Saturday we said we needed to look at the club from top to bottom. "We needed radical changes and I'm afraid John is one of those casualties. Economically, we can't run with a director of football and a manager. "John's ambition was to be here long term but we are where we are. We have to do what's best for Bristol Rovers in the situation we find ourselves in." After beginning his managerial career at York City, Ward's first stint at Rovers came between 1993 and 1996 and he guided the Division Two side to the Wembley play-offs in 1995. He went on to work at Bristol City, Cheltenham Town, Wolves, Carlisle United and Colchester before returning to manage the Pirates again, following the sacking of boss Mark McGhee. Ward helped stave off relegation last season and guided Rovers to a 14th-place finish. However, with eight games of the current campaign remaining, Ward moved onto the backroom staff as former Salisbury manager Clarke took first-team charge. Clarke, 36, won two of his eight games at the helm but Saturday's defeat by Mansfield, combined with victories for Northampton and Wycombe, saw Rovers drop out of the Football League for the first time in 94 years.